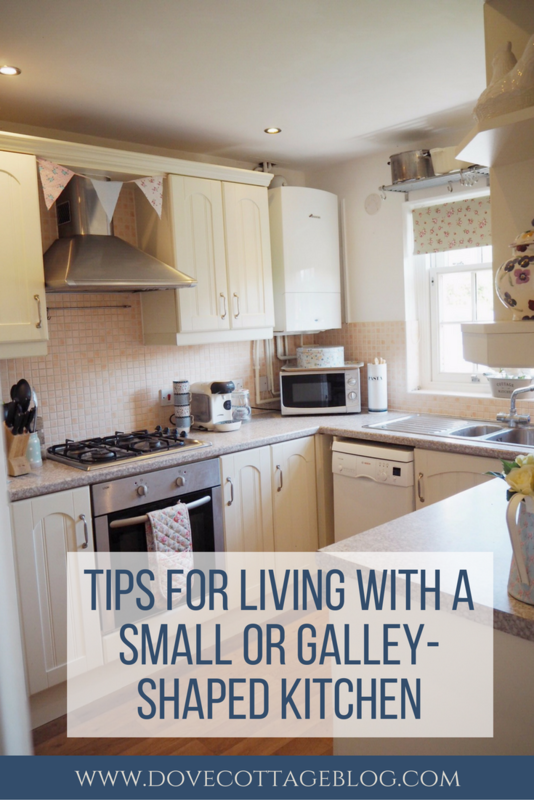 Galley kitchens seem to be quite a common theme with first-time homes, but although they can be quite small, there's no reason why they can't still be the kitchen you've always dreamt of. So I thought I'd share with you a few tips I've picked up whilst living in mine. Organisation - This seems to be the golden rule to living in a small kitchen, and I can't stress enough how important this is. If your kitchen is anything like mine, cupboard space is limited so you'll need to be ruthless to fit everything in. I've got a system that involves baskets, jars and everything having its place which seems to be working at the moment - it's funny how many bits you can squeeze in once you've got a system. Storage - I'm defiantly one for not linking having anything on show (have a look at my storage solutions in small homes post here for more on this), but there are a few bits that do live outside the cupboards in nice jars and pretty containers, freeing up valuable cupboard space. As part of this, storing some things outside of cupboards can also free up space for anything you might usually have on a worktop. For example, bread now lives in a cupboard so we don't have to find somewhere for a bread bin to live! Maximising space - Think about adopting the 'kitchen triangle' approach when deciding where everything lives. This is something my husband was adamant we would be doing, and I must admit, although I thought it sounded a bit ridiculous to start with, it really does make working in the kitchen 'flow' easily. The 'kitchen triangle' is a theory that all your important appliances (fridge, oven and sink) should be in a triangle shape within your kitchen (saying that, ours is a bit of an odd-shaped triangle! ), giving you a clear idea of where to locate the bits you use most, meaning you're not taking over the whole room every meal time. So for example, all our utensils are located around the oven, whilst our crockery lives adjacent to the sink. And although I still love using the 'I'll get out of your way' excuse when the hubby's making dinner, this is approach is defiantly helpful when having more than one person is in the kitchen! Wall space - Maximising wall space is also very important - I'll never have room in here for a dresser unfortunately, however my mini wall version gives me somewhere to display my pretty pottery, without taking up much room at all. In addition, why not think about putting something behind the door? We've got a blackboard behind ours, meaning there's no wasted wall space at all. Seating - Whilst a galley kitchen is probably not going to be somewhere you can have a table and chairs, why not compromise with a breakfast bar and stools? 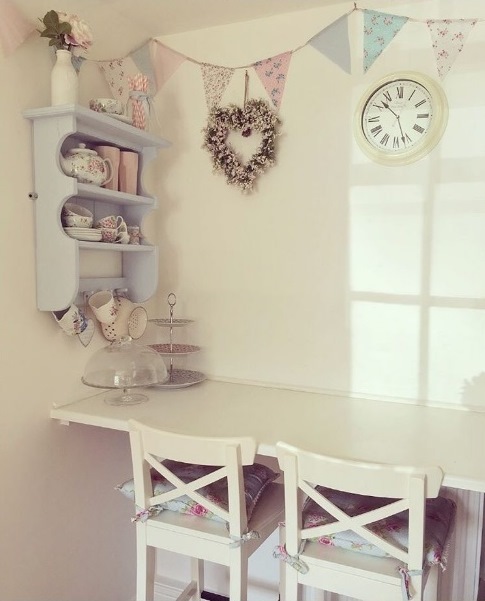 This is a bit of a life saver for us, being somewhere you can have a cuppa or a quick breakfast, plus also provides a more social area within the kitchen, whilst taking up very little space at all - you can find some stools very similar to ours here. We then have a dining table and chairs in our conservatory, where we can more comfortably eat dinner or have friends over. Have a look at my Beautiful Galley Kitchens board over on Pinterest for more inspiration. 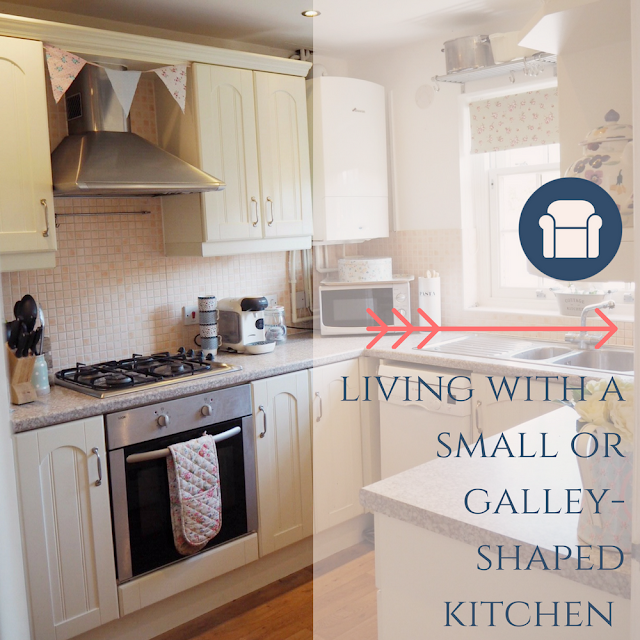 What are your tips for decorating a small galley style kitchen?